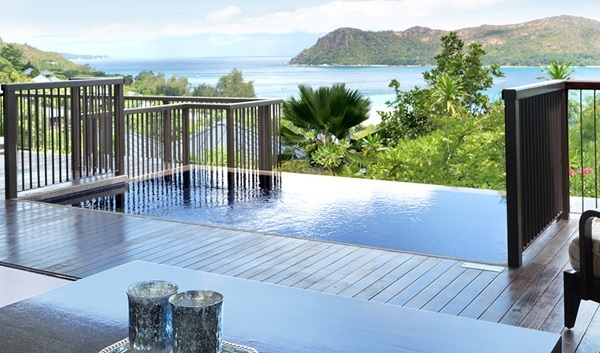 Raffles Seychelles is an oasis of laidback luxury located on Praslin. This is for paradise seekers wanting to infuse their holiday with a sense of wellbeing in an atmosphere of blissful relaxation. Raffles Seychelles has 86 villas each with a private plunge pool and outdoor pavilion to soak up breathtaking views of the opal-hued ocean, white sandy beach and lush green hills. Dining at Raffles Seychelles combines the best of Seychellois culture and cuisine with dishes from around the world, and Raffles Spa, located steps away from the coastline of Anse Takamaka, offers ocean views from its treatment pavilions. 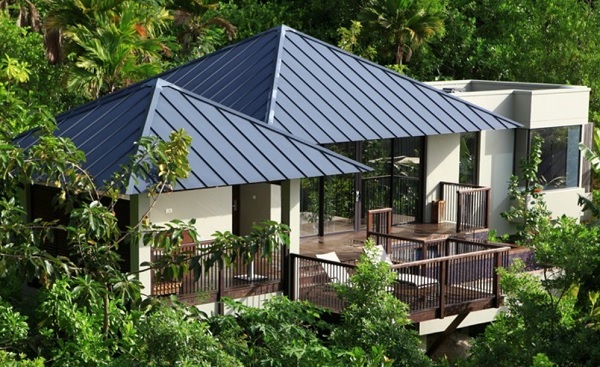 Another extraordinary luxury property in the Seychelles run by the superb Raffles. Raffles Seychelles is located on the Northeast coast of Praslin Island, approximately 30 minutes from Praslin Airport. 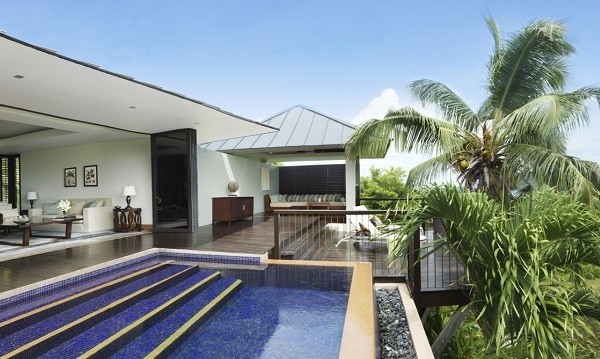 The 86 luxurious and contemporary villas at Raffles Seychelles represent some of the largest accommodation in the archipelago, ranging from 125 to 275 square metres (1345 – 2960 square feet). Thoughtfully spread across gently sloping hills, these villas combine privacy with breathtaking views of the Indian Ocean and the island’s lush and tropical greenery. Each villa features an outdoor pavilion with sun-loungers, dining table and private plunge pool, while an easel with sketching paper encourages inspired artists to capture the beautiful views. Garden View Pool Villas are located the midst of the islands lush tropical vegetation and surrounded by the Seychelles endemic flora. 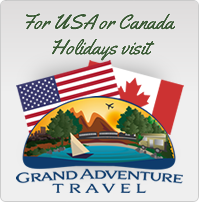 The tranquil Garden View Villas are ideal for those searching for peace and privacy. Panoramic Pool Villas are located on the highest point of the resort, these villas command spectacular ocean views. 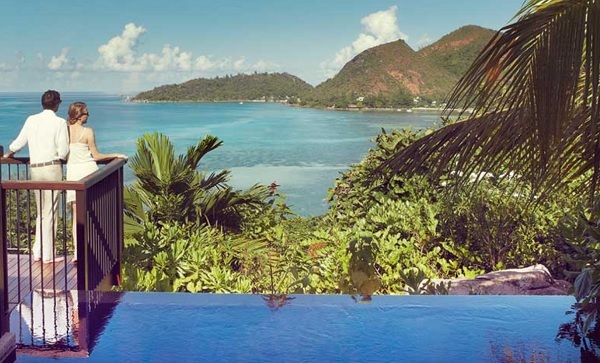 Partial Ocean View Pool Villas combine views of the azure ocean and tropical vegetation, these luxury villas capture the Seychelles natural beauty. One Bedroom Garden View Villas offer a haven of peace and space. Featuring a spacious separate living room and bedroom, they are an excellent choice for small families. One Bedroom Ocean View Villa command superb views of the Indian Ocean, these villas provide the perfect paradise setting to enjoy with loved ones. Each villa features a spacious parlour/living space spanning 70 square metres, a separate bedroom, a bathroom with a deep soak tub positioned to offer stunning views of the ocean, and a private outdoor rain shower. A private plunge pool, located on the terrace, and a spacious outdoor pavilion with day bed, dining table and barbeque grill, provides the perfect settings for private dining. A dedicated Raffles Butler ensures personalised assistance around the clock. One Bedroom Panoramic View Villa are located atop of the resort with uninterrupted 180 degree views of the Indian Ocean and surrounding greenery. Each villa features a spacious parlour/living space spanning 70 square metres, a separate bedroom and a dedicated kitchen area. The bathroom is designed to provide an abundance of natural light, and a deep-soak tub is positioned to offer stunning views of the opal hued ocean and surrounding greenery. An expansive outdoor pavilion with a day bed is complemented by a private plunge pool measuring 14 square metres, an outdoor rain shower, dining table and barbeque grill, and an open air balcony with sundeck chairs. Two Bedroom Beachfront Villas, the largest in the collection, provide a genuine sense of luxury with a clean contemporary style throughout, featuring an elegant parlour/living space spanning 70 square metres, two separate bedrooms, both with en-suite bathrooms, indoor and outdoor rain showers, and deep soak tubs. The interiors are matched with an equally impressive outdoor space, with an open air balcony with sundeck chairs, a sheltered pavilion with day bed, dining table, and a dedicated barbeque set up, perfect for arranging a private dinner prepared by one of our chefs. Two Bedroom Ocean View Villa offers a quiet sanctuary with magnificent ocean views. The villa features two separate bedrooms, both with en-suite bathrooms, and a spacious parlour/living space spanning 70 square metres, a generous outdoor pavilion highlighted by an open air balcony, a dining area with barbeque grill set up, and a private plunge pool. Losean Restaurant offers everything from breakfast dishes from around the world to an evening menu inspired by the Indian Ocean, Losean restaurant offers thoughtfully-prepared and contemporary food throughout the day. Curieuse Restaurant offers a gastronomic journey tracing through India, China and South East Asia, Curieuse, led by Chef de Cuisine Sunil Dutt, is the Seychelles’ only Asian restaurant. The Sushi Room at Curieuse celebrates the island’s world-class catch with an exciting menu of sushi and sashimi. Pool Restaurant & Bar showcases fresh, local products and light cuisine is a casual lunch setting, perfect for refuelling during a busy day of soaking up the Seychellois sun. Danzil Lounge serves perfectly prepared drinks against a backdrop of inspiring views towards the ocean. Pti Zil Beach Bar is located at Raffles beachfront and offers tempting mojito creations, local beers, fresh juices, smoothies and light snacks throughout the day. Takamaka Terrace & Shisha Lounge is a rooftop lounge offering dramatic vistas over the sea. Enjoy flavoured shisha under the stars, with cocktails and drinks from Danzil Lounge.